Larson Creek, the Flag River and other small tributaries flow into Lake Superior at Port Wing. Several researchers at Michigan Technological University are changing that. Their October 2018 paper in the Journal of the American Water Resources Association asks how these small streams impact the ecology and biochemistry of Lake Superior. "This is a paper that was very much intended to ask questions," said Amy Marcarelli, the lead researcher and an ecosystem ecologist at Michigan Technological University. "We wanted to throw questions out there to get people interested." Answers, for now, are few. Some of the smaller streams are monitored for fish or habitat quality, but very few people have considered how the streams link up to the lake because of its large size, she said. "Half of the water that goes into Lake Superior comes from rain, which is common in the Great Lakes, but very rare for lakes in general," Marcarelli said. "That makes the Great Lakes unique, and that makes it easy to think that the streams and the watersheds are proportionately less important." Water on its way to Lake Superior flows over Lost Creek Falls, located near Cornucopia. But the smaller streams may be more important than people tend to think, she said. "That was a significantly bigger number than anyone else had calculated before and really helped to emphasize the potential importance of streams as contributors to the Lake Superior ecosystem," said Colin Brooks, co-author of the study and manager of the Environmental Science Laboratory at the Michigan Tech Research Institute in Ann Arbor, Mich. There are eight or 10 major tributaries that are well monitored, and those tributaries make up about half of the watershed area on the United States side, Marcarelli said. But if you look at the other half of the watershed area, most of the streams are very, very small. "These are the little streams that in the summer you can stand over with one foot on either bank," she said. 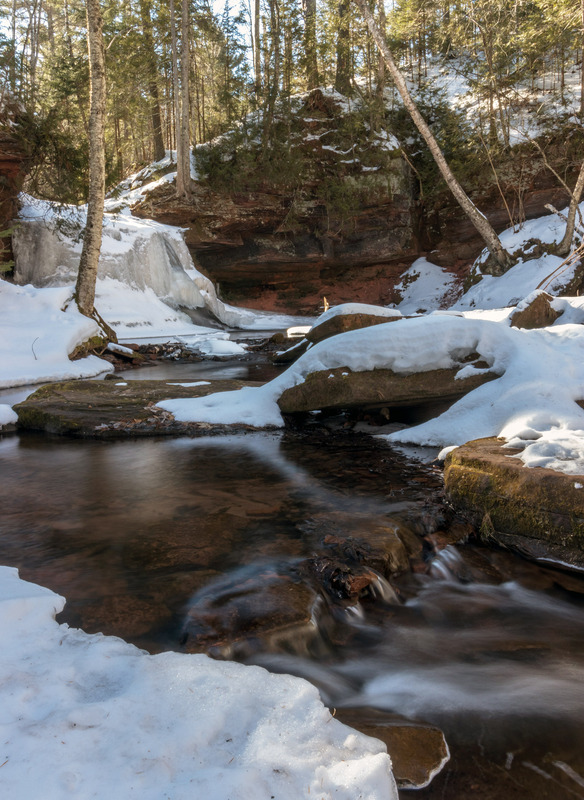 The researchers suspected that the importance of small streams to the nutrient budget and ecology of Lake Superior has not been properly considered before, Brooks said. They tried to measure the effect small streams have on Lake Superior, but were left with more questions than answers. Roughly 60 percent of the tributaries are on the American side, while 40 percent are on the Canadian side, Marcarelli said. 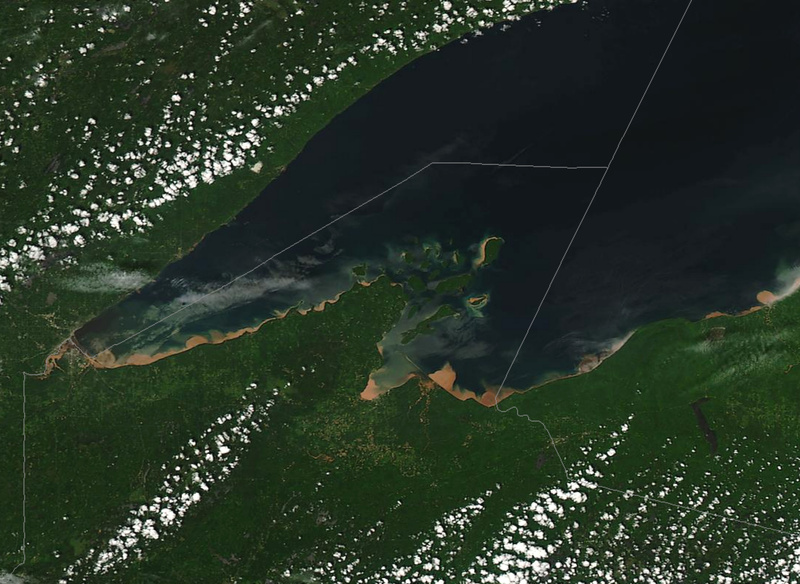 A satellite image from June 18, 2018 shows plumes of sediment flowing into the south shore of Lake Superior following heavy rains over June 15-17. "It's really hard to get satellite pictures in these regions because it's cloudy all the time," Marcarelli said. "The plumes are probably happening in the time when it's most difficult to get on Lake Superior." "They can swim through the plumes and measure the changes in water chemistry to try to figure out how big they are and how deep they are," Marcarelli said. They also used drones, which can be flown over various stretches of shoreline and used to map the plumes. "If we can use things like drone imagery, it will become a lot more practical to understand how changes in nutrients and organic matter are being affected by changing climate," Brooks said. By ignoring the contributions from all of the little streams, a big part of the story is missing, said Evan Kane, a researcher in the School of Forest Resources and Environmental Science at Michigan Technological University. "Little streams behave a lot like big streams do say in the spring or late in the fall," he said. "What's really interesting is that during storm events, the little streams and the big streams, that's when their true personalities seem to come out." It's important to realize that plumes are a part of the natural lake dynamic, Marcarelli said. They contain nutrients delivered into the lake, which fuel the productivity of algae, which feed the zooplankton, which feed the little fish, which feed the bigger fish. 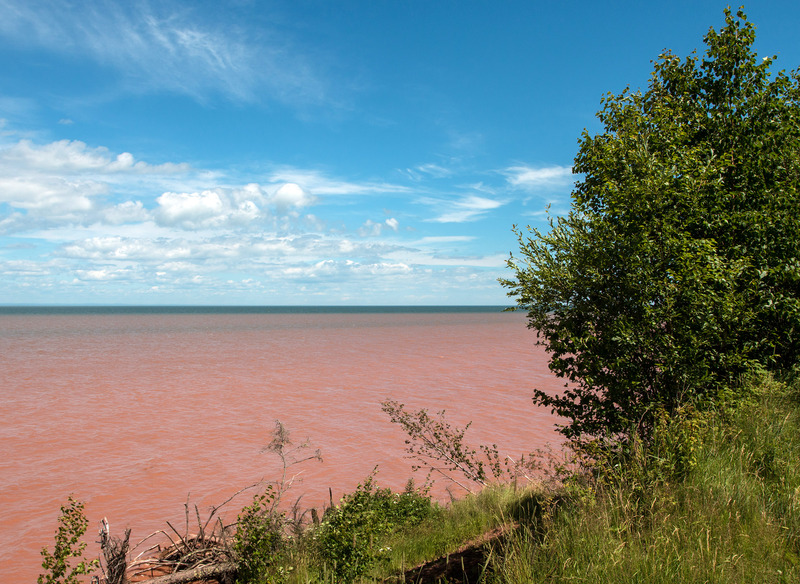 A post-storm plume colors the waters of Lake Superior at Port Wing. "When those storms happen, they cause a lot of erosion in the watersheds," she said. "When they do, the plumes tend to have a lot of sediment with phosphorus bound to it, which researchers think can then lead to these cyanobacterial blooms." Climate change has caused rain patterns to change, with more frequent and more extreme rainfalls, Kane said. It's important to understand the connection between the lake and its tributaries to predict the long-term impacts of climate change, Marcarelli said. "With climate change, not only do we expect those storm frequencies to change, we also expect the conditions in the lake to change," she said. Editor's note: This article was originally published on Dec. 21, 2018 by Great Lakes Echo, which covers issues related to the environment of the Great Lakes watershed and is produced by the Knight Center for Environmental Journalism at Michigan State University.